Travel style (admittedly for this editor) is something that’s not always front of mind. We can pore over images of celeb airport outfits for inspiration and covet a beautiful bag, but frankly, until we’re packing for our next trip, we might not notice that our carry-on is beaten up, hard to organize, and still has a faint stain from when that hair oil exploded on our last getaway. But Indré Rockefeller and Andy Krantz are bringing their luxury expertise to the travel industry, to finally give us some motivation to improve our tourist style once and for all. Launched today, Paravel is the duo’s answer this dilemma. 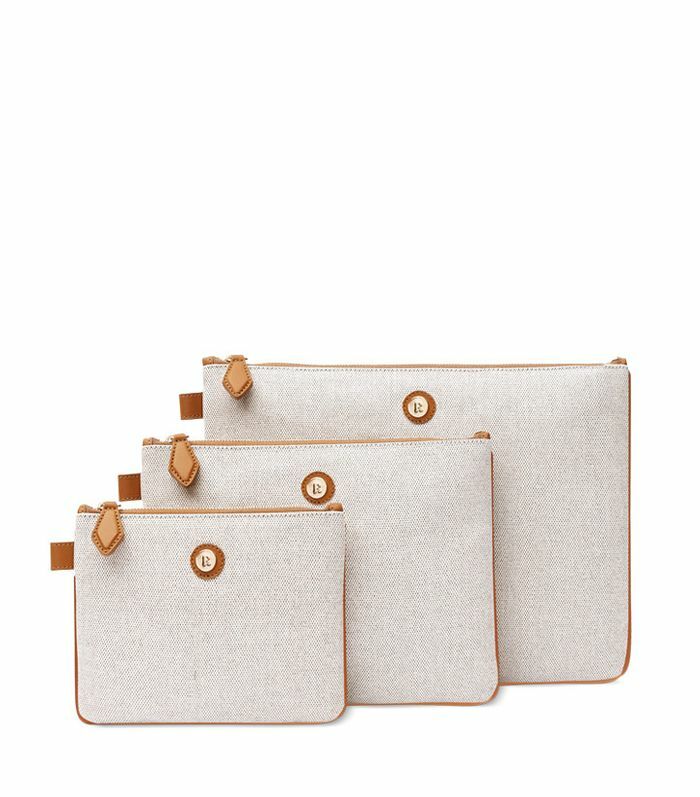 Both former staff members of the dreamy Spain-based brand Delpozo, Rockefeller and Krantz produced a fashion-forward line of water- and stain-resistant canvas bags that range from an oversize duffle fully equipped to carry a few days’ worth of clothing to small pouches and pockets that help organize every detail. “Our goal is to offer beautiful, practical things, all at an honest price,” they tell us of the line, which nods to retro design and rings in under $350. Scroll down for more on the newest collection every fashion girl will love, as well as each of these insider’s brilliant travel hacks. WHO WHAT WEAR: With both of you having backgrounds in fashion, what unique ideas and expertise did you bring to this new travel line? INDRÉ ROCKEFELLER AND ANDY KRANTZ: As passionate travelers and consumers, we felt we were being forced to choose between design and function when it came to our travel gear. We set out to create a brand that incorporates innovative travel-proof materials, meticulous construction, and delightful design to meet the needs of today’s consumer, who is always on the go. We worked hard to bring impeccable product to our customer at an honest price, without the traditional luxury brand markups. WWW: What are each of your biggest packing gripes, and how does Paravel address them? IR: My goal is to pack as efficiently as possible, so organization and space-saving tools are key for me. I can’t go anywhere without my Paravel packing cubes. For long-haul trips, I pack into the cubes by item—for example, sweaters, shirts, and socks—which avoids the painful suitcase floor dump when looking for something at the bottom of a bag. AK: My biggest gripe is with heavy bags—all leather bags weigh a lot before you put anything into them. Our signature canvas is light as a feather and has the added bonus of being impervious to spills and scrapes. The interior is spacious enough to hold a week’s worth of clothing, and the side pockets on the outside make getting through security a breeze. WWW: We’re loving the water-, stain-, and spill-proof quality of the canvas. It’s pretty genius! IR/AK: Accidents happen. Whether it’s spilled coffee, exploded shampoo, or a surprise rain shower, modern life can be messy. We want our customers to feel spontaneous and adventurous, so we created Paravel to take the worry out of travel. WWW: And finally, can each of you divulge some of your cleverest travel hacks? IR: I have a weakness for flea markets, so I always bring an extra bag. Our Stowaway suitcase packs completely flat for the trip over and then opens into an overnight bag large enough to carry all of my discoveries home. Also, I have lost some of my favorite embellished shoes to bad packing. Now I use our Memory Foam Pouch to cushion my Marni embellished sandals from the wear and tear of travel. AK: I keep extra hotel shower caps in my Paravel Wash Kit—they make great makeshift shoe bags if I’m in a fix and need to keep things clean. Have any more genius travel hacks to share? Let us know in the comments.